← What is the ‘Bulb’ Setting? The white (lower) graph shows brightness trends. The colour graphs show the tonal brightnesses for each colour. 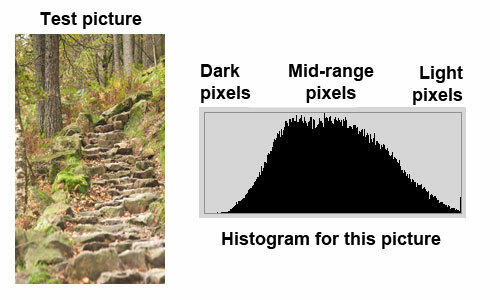 Modern DSLRs have a ‘Histogram’ function. It is sometimes hidden in the menu items, but it is there in up to date cameras. The idea of the histogram is to provide a simple analysis of the brightness of your shot. 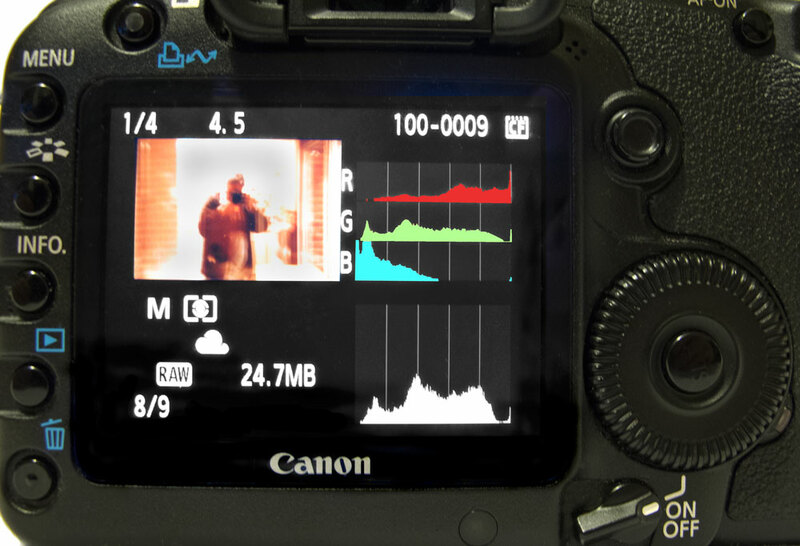 This article will show you how to use your histogram to improve your photography. You will find that most histograms have two settings. They are ‘brightness’ and ‘Colour channels’. In most cases the brightness is the useful setting. It gives you the best indication of the exposure effectiveness. 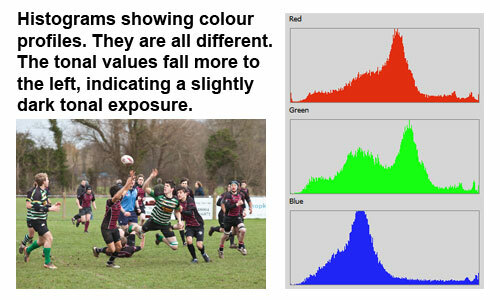 However, if you are particularly interested in colour distribution in your image use the colour histogram. This indicates brightness for each of the three colour channels. The histogram function is usually found in the menu settings. Setting it up usually just requires enabling that function. However, on some cameras you may need to make a change to the display setting as well once you come out of the menu. For detailed instructions on enabling and settings refer to your camera manual. It is a graph. When you take a picture your camera calculates how bright your shot has come out. 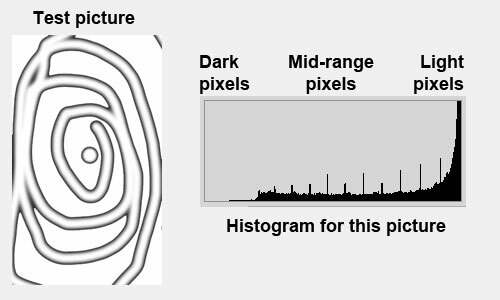 The camera presents the histogram as a line with thin upright bars on it. The bars are next to each other and together make a shape of solid white on the graph. Each upright bar represents the number of pixels of that particular brightness. Across the horizontal width of the graph the spread of bars shows how brightness is distributed. The left side of the histogram is the shadow side – indicating the extent of the shadowed/dark pixels in the shot. The right side is the highlight side – indicating the extent of the brightness of pixels in the photograph. In the middle area of the graph there lies the mid-tones. You read the graph by understanding the trend of the curve created by the bars. More of the bars on the left side tells you there are more dark pixels – the shot may be under-exposed. More bars on the right side indicates the picture will be bright. The further right the greater the brightness. If the graphs leans up against one side or the other this indicates that some of the pixels are either completely black (left side) or completely white (right side). Where this occurs there is usually lost detail which you can not recover. If a high proportion of the pixels are on one side the picture will be under-exposed (right side) or over-exposed (left side). Picture showing a dark overall spread of pixels. The trend of the pixels is to the left - when they are up against the edge of the graph there is some lost detail in blacks. A right hand side trend indicates a bright picture overall. A histogram up against the right hand side of the graph indicates lost detail in the whites. In an ideal exposure you will find an evenly shaped peak in the middle showing a good distribution of light and dark across the shot. Detail will not be lost if there is no contact with either side of the graph edges. The histogram will show a good distribution evenly across the centre of the graph for a good exposure. An even distribution of the bars in the middle of the histogram indicates a good exposure in the mid-range of brightness. No detail is lost in the extremes of whites or blacks if no histogram bars are up against the right or left hand side of the graph. The distribution of brightness on the histogram is only an indication of the success of your exposure. Pictures with a white background, like some portraits for example, will show a bright, right-side histogram. You may accept that because you intended the background brightness – as long as your portrait subject is well exposed in front of the white. The camera is merely reporting the data it has collected. It up to you to decide if the shot you got is correct. The histogram reports the status of the brightness and you can ignore it or decide to shoot again. That is the beauty of the histogram – it helps you decide if you have got it right or not. It it is particularly useful to identify if there are any lost details in the extremes of the light range (the blacks or whites). The colour graphs show tonal variations on three colour channels, red, green and blue. The shape of each colour graph shows tonal brightness from dark tones (left) to brighter tones (right). 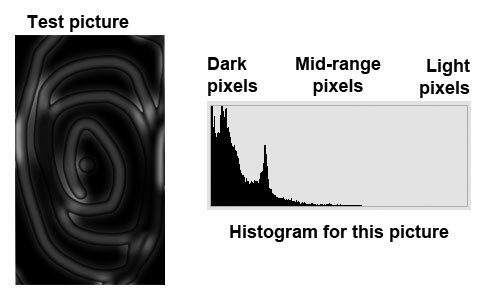 The shape of the graph indicates the brightness and detail clipping in the same way as the brightness histogram. A tonal distribution which is a little on the dark side of the histogram. A good exposure in rather poor light. The different colour profiles provide an indication of the colour variation across the tonal range. The shape of the colour histograms indicates the same outcomes as for the brightness. 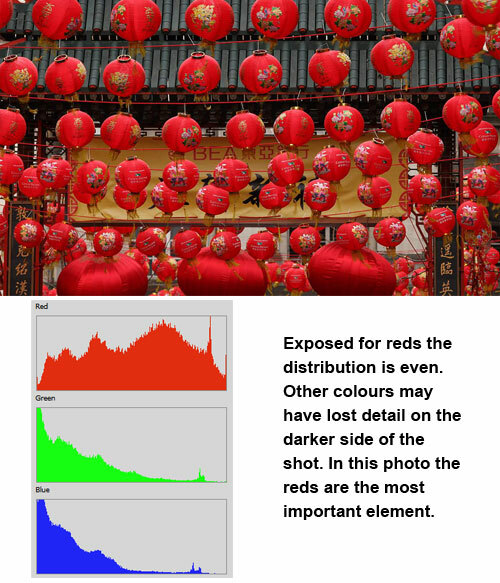 Shows histogram distribution to support a dominantly red photograph. This entry was posted in Background Info., Equipment, Starters School, Tips Tutorials & Techniques and tagged Camera, Creativity, exposure, Histogram. Bookmark the permalink.